It is now many years since I did any heavy scientific lifting. But, the fun part of writing for Volcanocafé is that I get to do quite a bit of work in the field of volcanology in a relaxed popular science setting. It is a rather well-known secret that I lean on the amazing plotters that we have had through the years, all the way from the grandmaster of Geolurking, to the latest plotter in the form of Andrej Flis. Sometimes it all starts with me having an idea that I want tested against data, and other times it is the plotter that comes with a plot that shows something odd. Through the years these marvellous plots have shown things hitherto unknown about Icelandic volcanoes. So far, we have found unknown magma reservoirs under volcanoes thought to be either extinct or highly dormant. We have found that at spread centre volcanoes there are often wedge-shaped dykes working as deep magma reservoirs. My favourite is though that I got to test a more profound theory against real time data. Back in 2011 I had an idea that we would be able to track the Icelandic mantle plume magma pulse that comes around roughly every 200 years. That pulse heralds both an increase in the frequency of eruptions, and is also a sign that there might be a large rifting fissure eruption around the corner. My idea was very simple, any pulse from below would be visible in the form of a marked increase in deep earthquakes in the crustal layer next to the boundary between the crust and the upper mantle. My mental image looked something like a soft pillow hitting the underside of a mattress in slow motion, with an epicentre close to the location of the plumehead. In 2013 we started to see that increase in deep earthquakes, and from then on it was a case of chasing the earthquakes to try to see where the first eruption would strike. 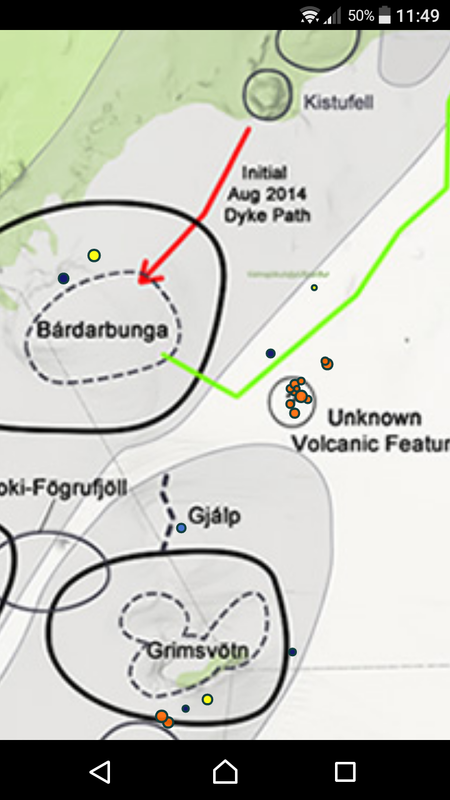 A few weeks prior to the start of the Holuhraun eruption I knew that the eruption would come from Bárdarbunga. It was the first time that an eruption had been accurately forecasted from a hypothesis that had not been tested, and it was predicted a year prior to onset (obviously the forecast was updated as new data came in to pinpoint the volcano). My point is though that none of these things would have been possible without all the marvellous plots that are produced by the people behind Volcanocafé. It is through all the data-wrestling that we can reliably say things. Any hypothesis is just another wild idea until it is tested against the raw data given to us by nature. In the case of Holuhraun we had a wild idea by me tested against data, then the idea was refined into a hypothesis, and later it was proven correct by a rather stupendous amount of magma. It still gives me a yummy feeling of science in my stomach. A couple of weeks ago I started to rewrite my woolly mammoth series about Icelandic volcanism, and I partially rewrote the part about the Reykjanes Ridge volcanism. In particular I wrote about the Eldey-Geirfuglasker Volcanic Belt. The next day I was sitting down to plan for the next part of the series when Andrej sent me new plots that he had made off the Eldey-Geirfuglasker area. I must admit that I groaned a bit as I looked at those plots, since I was in complete shock. I went from being rather pleased with myself to realising that I had just published an article that was to be thrown unto the garbage-pile of extinct science. But, since I am me, a little while later that yummy feeling of science started to spread throughout my body, and I got around to planning an entirely new article in the series about Icelandic volcanism. Now it is time to get to the candy itself. Sideview of the Geirfuglasker central volcano complete with deep feed, magma reservoir, and feeder tube to the tip of Reykjanes. The plot shows the extent of the fissure swarm. Image by Andrej Flis. For the regular readers of Volcanocafé it is well known that we use earthquake data positioning to track everything from magma reservoirs (shown as voids in the plots), to intrusive dykes, sills, and central volcano fissure swarms. 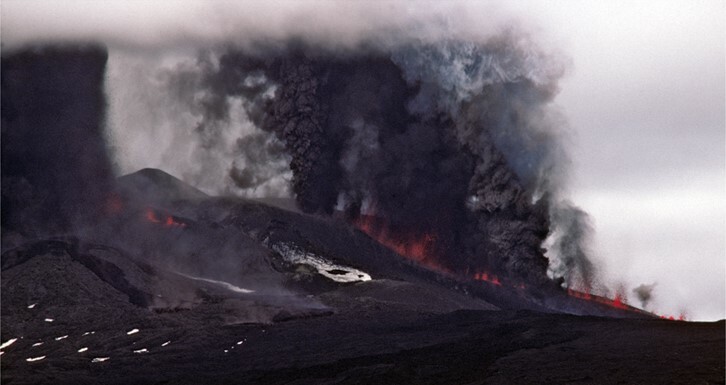 According to the classical model the Reykjanes Ridge is not containing any central volcanoes. Instead volcanism is caused by episodic intrusions as the Mid Atlantic Ridge is pulled apart. Whereas a central volcano has a complete magmatic system with a feed from the mantle leading up to either a deep reservoir and then onwards up to a shallow magma chamber, or going directly up to the magma chamber. The same image, but viewed from top. Image by Andrej Flis. This magma chamber should be a permanent fixture, and not an ephemeral construct consisting of a onetime dyke or sill. In Iceland it is also more or less a given that a central volcano should have a fissure swarm of its own where known fissure eruptions has occurred. None of these things was known to exist for the area as I wrote my previous article a little bit more than a week ago. Still, they did exist in glorious detail in Andrej’s earthquake positioning plots. In fact, it is one of the clearest instances we have seen, so it is a bit of mystery that it has been missed. Closeup. The red line at the top is the Eldey-Geirfuglasker area. To the left is Skerja and a clear discontinuity where the fissure swarm ends, and to the right is the area towards the Reykjanestá. At the bottom of the reservoir we see the feeder tube running off towards the tip of the peninsula. Image by Andrej Flis. If we start at the bottom, we find an elongated SW/NE-trending deep sheet of earthquakes that continuous upwards. The bottom of this deep feed system is at 27km depth and it continues up to 15km where we find a kilometre-wide sheet-dyke that goes all the way up to 7km depth. The sheet dyke shape of the magma reservoir comes naturally from the spreading of the MAR, what differentiates this dyke from others is the width, at a kilometre across it is sufficiently large to be a permanent fixture containing quite a bit of magma. I roughly estimate the magma content to be 35 cubic kilometres. Not that large for being Iceland, but still enough to be considered as a magma reservoir. View from the top showing details in closeup. The yellow circle is the reservoir area under Geirfuglasker and Skerja. The feeder tube is doing a distinct knee like turn. The red area is the Eldey-Geirfuglasker area. The knee area reminds of the bend at Holuhraun. Image by Andrej Flis. From that reservoir there are cracks leading upwards to Geirfuglasker and Skerja (see map, the volcanic feature next to Skerjadjúp). But, there is surprisingly little activity going on at Eldey. This means that an eruption at either Geirfuglasker, or Skerja could occur quite rapidly. And that an eruption at Eldey would only come after quite a prolonged seismic unrest. It is though good to remember that this area of Iceland is intensely seismic, and that any eruption would most likely start after a rather hefty earthquake swarm. In other words, if it is not memorable it is not happening. Now that we have found that the fissure swarm is extending to the south-west a few kilometres to Skerja, where it abruptly ends, it is time to see if we can find a north-east continuation of it. And it is here that we find something so dramatic that it is accompanied with the angelic choirs normally only associated with baby Jesus on Christmas. Plot of seismicity over time. Sizes and depth is shown. Image by Andrej Flis. What we find is a continuous feeder tube extending from the bottom of the magma reservoir under Geirfuglasker running at an upwards angle all the way up to the tip of mainland Iceland. This connect well with petrochemical data that tells us that the magma found at Eldvorp is of the same type found at Eldey (and hence Geirfuglasker). Or, in other words, the tip of Iceland is a flank vent of the oceanic central volcano of Geirfuglasker. Surprise is a very mild word in this context. View from above with outline of the tip of the tip of Reykjanes in the upper right corner. Note the clear discontinuity after the landfall of the feeder tube. Image by Andrej Flis. In science one should always point out any flaws in a theory. And here there is a glaring one. By nature, the data we are using are earthquakes, and since the entire volcanic feature is situated on a major tectonic fault, the bulk of the earthquakes we are mapping are tectonic in nature, and not volcanic. In an ideal world we would filter out all earthquakes not containing a magmatic or volcanic signature from our maps. This is though not possible from the data that we are using. Instead we are using shapes, figures, voids and discontinuations in the data to glean what is hiding inside the crust. Here we interpret the data as being connected to overlying volcanic features. The data is though so impressive that we strongly believe that we are correct. But, we would be happy if any young strapping Ph.D. student would do the legwork and filter out the volcanic type earthquakes from the tectonic to produce a better validated model than we could. I am certain that the same basic model would come out of such a dissertation. But if not, we would in the end have an even better scientific understanding of a truly intriguing part of Iceland. Being wrong is also a yummy part of the scientific process. Any idea if there is a way of digging out moment tensor data from IMO? I imagine a good preliminary filter would be to separate them by fracture mode. Downside, rifting and intrusion events would probably both be mode one fractures. Now, as for volcanics at the tip of the reykjanes being a “side vent”. That logically fits since its an extention environment and the confining pressure would be less along that route. Sort of how holuhraun magma was steered to its position by the path of least resistance. We, humans, tend to be biased when we look at Iceland´s map, and see the coastal contours. Because from a magma perspective, there is no difference that the crustal surface is underwater or abovewater. Also, sea levels rise and fall with ice ages, so back 12000 years ago, Geirfuglasker central volcano was clearly visible above the ocean and with its NE fissure swarm region. The same might apply for the Westman Islands and Tjornes/Grimsey. Then the opposite happens when sea levels were slightly higher in early Holocene (and post-glacial rebound had not started yet). A large part of the SISZ was below sea level, and a few seemingly extinct volcanoes were islands south off the early Holocene coast of Iceland (like Hestfjall and Vordufell). Eyjafjallajokull was probably a peninsula. And Reykjanes tip was under water (so was the entire Geirfuglasker fissure swarm), the coast would have ended somewhere near Krisuvik, with Svartsengi as an island off the coast. Not so much Eyjafjallajokull as Skaginnfjallajokull! Can’t quite pronounce “Vaðlaheiðarvegavinnuverkfærageymsluskúraútidyralyklakippuhringur” yet though…. I have no idea why! Understanding Icelandic language involves a knowledge of Proto-Germanic from which Old Norse, Old English, Gothic, etc. descended. If I recall, the thorsja lava flowed over that area. Did that happen after it was above sea level or did the flow fill in the bay? I wonder if the presence of water in the area could have been responsible for some of the highly explosive early eruptions from hekla – making the ash more fine so it spread out further. If eruptions in that area had actually started when the bay existed it would have been a sight to see. Thank you for a truly enlightening article Carl and for the work also done by Andrej. For very many years now I have looked at the myriad quakes in that area of the Reykjanes Ridge and pondered and wondered if there was even the slightest possibility there could be some volcanic context to them. Remember, I was young still when the wonder of Surtsey arising from the sea gripped my imagination and gave birth to a total fascination with volcanoes and Icelandic ones in particular. Sadly I have never been able to fulfil my ambition to visit Iceland and it is becoming increasingly unlikely that I ever will be able to visit. However the wonder of modern technology, including Google Earth where I can ‘fly’ there any time I wish has helped keep my interest in Iceland alive. Now you have given me one of my best presents ever, the knowledge that more likely than not there has all along been a volcanic component to some at least of these quakes in that area. Very many thanks to you Carl and Andrej for that and for the way you make things easy to understand for ones like myself that left school a lot more than 50 years ago. Agung erupting again, a nice size plume after a very quiet night, seismo showed a quake then off it went again, looking quite ashy too. Quake, Thursday 06:02 Plume begins Thurs 06:04:47 on Bukit cam. Carl and Andrej, I award you guys, the noble prize for Icelandic volcanoes of the year. This is big stuff indeed. Impressive. First it let us know that there are central volcanoes along Reykjanes volcanic region. Perhaps others, like Krisuvik or Hengill may also harbour central volcanoes. Second, it explains surely why some Reykjanes eruptions have been pretty large and ashy in the past, reaching up to VEI4. This has implications being located so near the International airport. The feeder dike reminds us of a smaller version of Holuhraun. Third, it shows that the situation is in place that allows for a significant eruption to happen at this region in the near future. Reykjanes was always one of my best anyways, as it has erupted often throughout Icelandic history. Andrej, have you located other central volcanoes and feeder dikes in other regions of Iceland? I would study this also around Vatnajokull (other estimated central volcanoes around Bardarbunga and Grimsvotn), I am sure one would find interesting and unexpected data. I have had a broad look, but so far I have not performed a specific search for anomalies, except what poops up along the way. But I will do it sooner or later. Maybe the complexity of Iceland is finally destroying my brain, but I don’t really see what difference this makes, to me it seems to just “confirm” what we already thought was the case out there? On another note, have you ever discussed your/our ideas about Iceland with the officials? I wonder what they think of it all. That being if they’re actually that interested or if they’re too busy trying not to be hit by a swan invasion!! Have you found that “soft pillow hitting the underside of Iceland” around 15-30km across Iceland? Did the pillow affected all regions at same time in 2013 or was it first in Vatnajokull and is now spreading across other regions further away from Vatnajokull. I have this untested theory that the plume “hitting” takes time to spread southwest and north from Vatnajokull, in the upper edges of the mantle. Because when I see the Icelandic volcanic record in front of my eyes, I see first eruptions starting in the usual suspects in Vatnajokull and then eruptions occurring across other volcanoes in Iceland in later years. But this might be bias, because Vatnajokull volcanoes are faster to erupt, because of more open conduits. That’s just given me an idea. 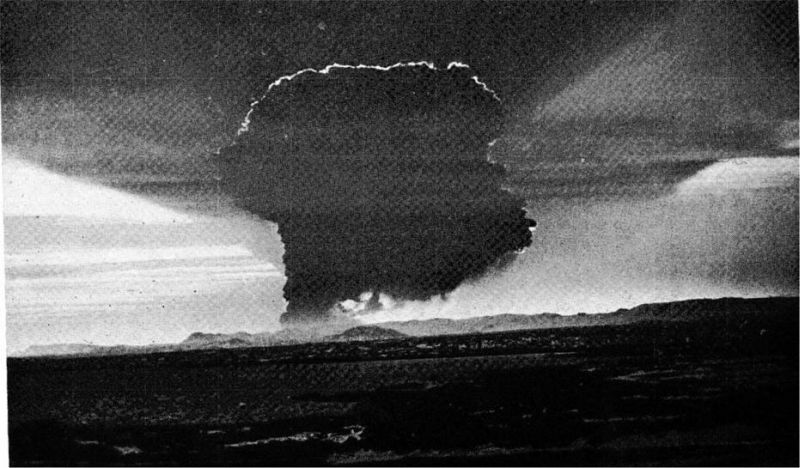 I wonder if we could make a time-series video that shows the chronological locations of eruptions in Iceland, similar to ones that show the progression of an earthquake swarm, or that video about nuclear bomb detonations. Maybe that could help to see the influence of plume activity? However the record (of Icelandic eruptions) is scarse and incomplete prior to 1700. In fact it is only more or less complete until the mid 19th century I would say. We aren´t even sure if Katla and Hamarinn erupted in 2011. One should cross this list with GVP data, and data published in several tephra studies. I will defer to Carl’s words when it comes to Hekla. If it doesn’t look like utter carnage….If it doesn’t look like utter devastation, it’s just clouds. You are correct of course, but as I’m away from work and… in a relaxed frame of mind, shall we say…. Allow me a little poetic license ! So if it doesn’t look like a Hieronymus Bosch painting (with added burger stands and purveyors of fine ice creams)…. My idea of what an eruption from hekla might look like is that the start would be something like the recent eruption at bezymianny but possibly a lot higher cloud, followed by a lot of lava erupting afterwards. It’s been almost 18 years since it last erupted so it’s next eruption might be somewhat bigger than the 2000 eruption if the Magna supply rate has gone up since 1947. Maybe it wouldn’t take as long to have a really significant eruption as it used to. To be clear: a few hours of explosive Ragnarök followed by biblical lava floods. I’m exaggerating. But just a wee bit. This is a beast of a volcano. And judging by its age, its peak is very likely in the future. More frequent eruptions means a higher heat flux. Higher heat flux means more melting. More melting means bigger magma chamber. Bigger magma chamber means more magma. More magma means… flood basalt…? If (probably when) hekla has a real flood lava eruption, it would be the real ragnarok. Like laki with added krakatoa at the start. I am very interested to see what Carl has to say about this when the series gets around to hekla. One star on the iceland map come and gone 3.6. Its still on the volcano app. Why has it gone on the imo site? I can only assume that the data has not been updated to remove the earthquake from the database yet. Very nice post with data and modelling! Thanks Carl and Andrej! For anyone poking about looking for a culprit volcano the explain the hard cold of the NE and Central US… there isn’t one. 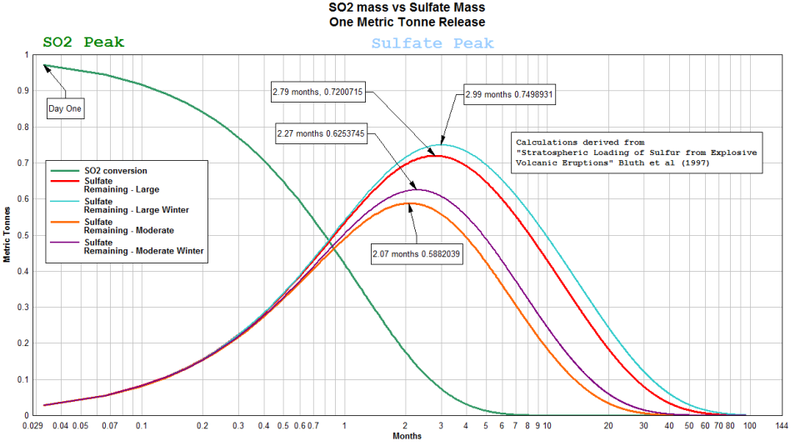 Everything that has gone off recently has been tropospheric only for sulfur emissions, and the only one that really reached the stratosphere was Bezymianny, but its SO2 will not peak in sulfate conversion until around 18 Feb 2018, placing it out of the running as well. Face it, it’s just cold. “it” happens. Speaking for California and the West Coast, this La Nina is weak, and not ideally located in the 3.4 region of the tropics…..plus it will soon be on the wane as we transition towards La Nada. Also, up till now, the SST-atmospheric teleconnections have been correspondingly weak….with minimal MJO activity to help stir things up. Normally with La Nina the PacNW should be getting clobbered, but the west coast ridging has been regularly extending on all the way to Alaska under a nearly-continuous highly amplified pattern…hardly the zonal flow that La Nina is noted for. Out here, we are hoping for a generic change in the pattern come the first 1-2 weeks of 2018. Until then, blocking and a possible cutoff low (two) associated with a Rex block centered right off the coast will continue to dominate. There is an outside chance some sub-tropical moisture may get entrained into the CoL’s which may bring SoCal this Fall/Winter’s first decent rainfall…. but I’m not holding my breath. Possibly. I’ve see a bit of stuff flopping around on the deck indicating so. The looming Niño turned out to be a wash and some noise was made about Niña conditions beginning. The problem is that Niña is supposed to take a bit of time to start showing an effect, so it might be a bit early for that. I’m just gonna count it up as “winter.” After all, winter tends to show up about once a year, and we are due for one. There’s one that’s gone stratospheric, in a very big way, but it’s way too soon to have any impact yet. Won’t say so in a month. It didi, in all anonymity, quite a feat of its own, a few days ago…. 15-17 km high. That’s the stuff we’re looking for. Off topic: the amazing thing is that the lava dome on the summit is yet again building back. Probably more to come. Russian Saint Helens on steroids. I wouldnt be suprised if the dome fills in the 1957 crater before it turns 100 years old. When that happens it might blow up again (or before then). The 1957 eruption was big, but I don’t think it was big enough to account for being dormant for 1000 years, so the continuous activity since then might not stop it from a repeat of that eruption. Clearly this recent explosion shows it is capable of much more than dome extrusions at the moment. That’s the deal with this type of explosive volcanism…. You never know when it’s gonna go and how far it’s gonna go. There’s some indication that the silica contents in the material erupted is going down and down, from straight dacite in 1957 to almost-basaltic andesite nowadays. Bezymianny’s eruptions are also less and less extrusive, they don’t push out spines anymore, and the “dome” (I say it that way because it’s more of a mini-stratovolcano than a true dome) grows more by effusing viscous lava from the top than by endogenous growth. It’s getting rid of the remnants of its 1000-year slumber, kicking out more and more of the evolved stuff sitting into its chambers. 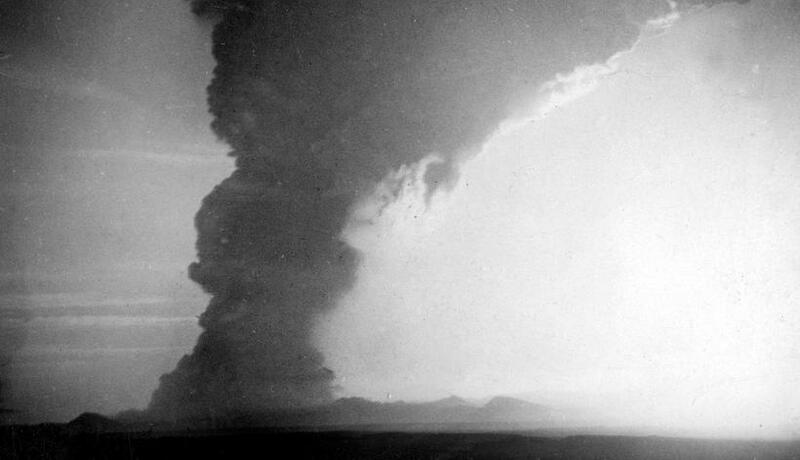 Soon enough, we may have a surprise… in the form of a massive mixed-style eruption. This was the way it erupted before it closed its previous active cycle, 2500-years worth of subplinian eruption accompanied by profuse lava flows. We’re far from the end of the show. BTW: the Kliuchevskoi volcano group (Tolbachik, Kliuchevskoi and Bezymianny to quote only the known active ones) is well worth an article in Volcanocafé. You have, very close to each other, Russian Kilauea (Tolbachik), Russian Mount St Helens (Bezymianny), and Russian…..errrr…. fricking Mount Doom. Yeah. Kliuchevskoi. 6000 years young, 4895 m tall, constantly erupting in every way possible, from Etnean excentric eruptions (1938) to basaltic Plinian (1994), without taking a breath. Magnificent. May not collapse as easily as you think…. Yes it has its share of basaltic gravel in it, but it’s also a very prolific producer of lava flows. Between 2 basaltic plinian or subplinian bursts. Just for the show and awe, here I post one of my favourite links about volcanics, Photovolcanica. This site (I’m not here to make an advertisement of course, just to give thanks and credit) is freaking awesome. And this speaks for itself…. and it was a very subdued one..
That one, however, was not subdued at all..
PS: just for the heck of it, here is what Tolbachik, the Russian Kilauea/Mauna Loa, is capable of when he gets really angry. 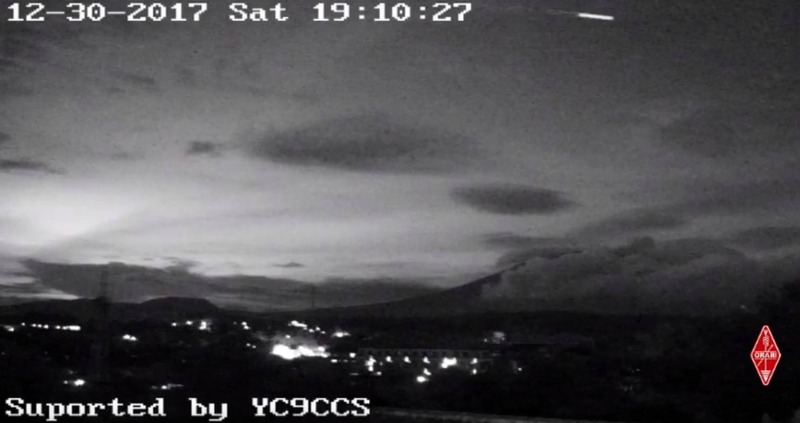 Looks like Etna’s New South East crater having a bad day. Great link. Awesome pics. My favorite volcano. Bezymianny went pop on 20 Dec 2017. Add 60 to 90 days and that’s 18 Feb 2018 to 20 Mar 2018 for peak sulfate conversion. In my opinion, at worst, it will delay spring a bit. Note that the cent/eastern half of North America is pretty much the only place on the planet with below normal temps. Plus, there’s a weak Polar Vortex which is allowing cold air to continue to dig over the continent. The polar vortex has been weak for years. It gets its energy from the temperature difference between the polar and middle latitudes. It weakened because the polar regions have warmed so much. As a curious effect, it makes omega patterns in the jet stream more likely, such as what is affecting the US northwest at the moment. That’s certainly the case for the Northern Hemisphere, but us folks down south have seen the opposite. I forget the name of the 80 cycle where temp anomalies oscillate between north and south. I believe that the southern jet has moved closer to Antarctica but there is little published (at least in reliable sources). One claim is that the ozone hole has been the dominant effect in the south, while in the north ozone has had much less effect (the south being MUCH colder and its ozone hole much bigger). Great article Carl on the land of ice and fire. Here’s a video of Agung this morning. Apparently whoever has a death wish. And another. Should have posted this first. Oh stuff, I was going to post the link to this video! Thanks CDaley55. Anyhow, the link is https://www.youtube.com/watch?v=cQZzYieXduQ and the long version is worth watching. One thing I did notice is that there is visible flame at the surface at the base of the steam / ash. Also, in this video, there appears to be a curve of standing water on the left side of the lava mound. 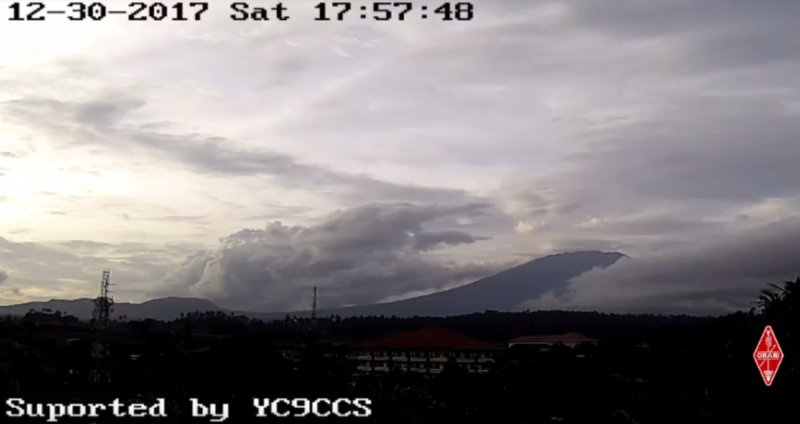 one thing I’ve noticed through my Agung cam addiction is that it might be erupting from more than one vent, not all at the top of the mountain. Anyone else see this? Posted some pictures but stills don’t always capture it. 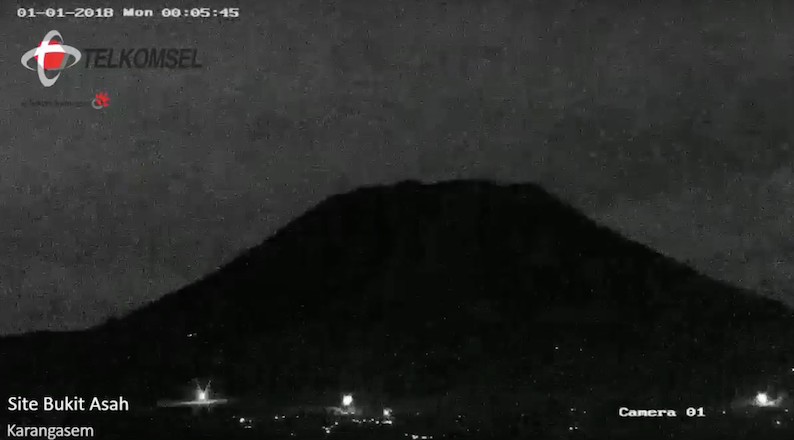 Agung is doing annular explosions on top of a growing lava dome….. like Semeru, Colima, Santiaguito and some more I don’t remember….. I shouted dome because I am used to 2d views down telephoto lenses. Not used to volcano terminology. Definitely some height to it, couple hundred feet or so at least. If the mound breaches and finds some pooled water at the bottom could it be dangerous? Yes, it looks like is has build up a bit. That means that the lava lake has become solid enough to build on it! Note that there is also heat coming out around the edge of the crater, perhaps because of cracks where the lava has contracted a bit. Prudence is not being “chicken.” Prudence is surviving. If death is gonna get ya, it will. The idea is to not place yourself in a situation where death is a high probability outcome. Make death work for the kill, that’s it’s job. If it has to search the planet to find you, that gives you time to procreate and make a new generation. Maybe have a beer and congratulate yourself that “it ain’t you” this time around. And if you are feeling generous with your new found lease on life, to lend a hand helping those who just managed to get away or were displaced. Our only real strength as humans, is our ability to help each other out. Based on the current seismograph, I am ready to call Agung’s eruption finished. The only two significant evens over the past 24 hours are echoes from more distant quakes. If Agung behaves as in 1963, that means it is now entering its most dangerous phase, but with a good chance that nothing more will happen. Maybe in the next few years the eruption will resume and blow up the lava in its crater. Like kelud only on a tall mountain and with no lake. If agung is mostly made of loose tephra and rubble, would it be more at risk of a new eruption blowing out a new vent on its flank? The last eruption left an open crater, but now there’s a big dome/ lake of lava that is blocking the main vent and this might be a bit much for the next eruption. A flank eruption wouldn’t have to be big to be a lot more damaging, especially if it involved more liquid lava from deeper in the system which could flow into populated areas. Kelud or St Vincent’s Soufriere comes straight to mind. No worry about the lava dome, it will end up raining down as chunks on the surrounding countryside. And as a flank eruption at Agung… No, please no. Don’t bury Besakih temple under lava. That would be the Shiva inside you, blasphemating Brahma the Creator. Utterly disrespectful. At least lava flows can be escaped from. It will be a tragic loss of property and livelyhoods, but in this case nobody should get killed (except the casual fool, who would get closer to the erupting cinder cone “just to get a better picture” and get a faceful of cowpie bomb). Pyroclastic flows or truly explosive phases, well…. the only way to escape is by not being in the blasting zone when it happens. Maybe so, but I essentially called out Agung back during it’s most energetic phase as there not being really that much to it. Bezymianny as much as proved my point on the 20th of December. Agung’s current episode isn’t really that fancy. Let us hope You are right, that we do not get a new years firework this time and that the population can move home to continue their lifes! On the Reykjanes ridge, it is notable how well the earthquake pattern correlates with the bathymetry. The hole around Skerjadup is where the earthquakes terminates, and the big stack is where Geirfu peaks. The dike-like feature is where the ridge is again a bit lower. That of course is typical for magma chambers, as they push up the land above them (magma is lower density, so the whole region floats a bit higher). I can buy this part of the model. Seeing Reykjanes as a flank eruption is a bit more of a jump, as this would make the flank erupt at a higher altitude than the originating volcanoes. You are proposing that the magma flows uphill. The dike should stop at the point whether the sea bottom rises to the land peninsula. It is quite a sharp rise in the bathymetry, and I think you can in fact see this termination. The Reykjanes earthquakes are I think mainly tectonic, and I expect may have a different origin. I usually only provide the data, but I don’t do any special theories/models. At least not publicly. But in this case, I have actually recently stumbled upon some tomography of that far SW corner where the batch of EQs is that seems to be at the end of the “dike like” path. There is a low velocity zone around 3km and a known geothermal area, which basically indicates a subsurface storage/emplacement of magma. There is almost none seismicity below 7-8km in that region, and I would not be ready to simply assume that magma came up to 7km without any noise whatsoever. But it came from somewhere.This is not a prove that the magma came via this “dike canal”, but it is plausible at least as an option. You should add some of this to the post! Seeing as this post is about the discovery of a new central volcano that wasn’t known to be one before, I have a related question. When did the most recent central volcano in Iceland form? Or rather what is the youngest Icelandic volcano that we know of. (I’m guessing it might be hekla, but I donk know as much as some of you do). So what are you going to name your new-born baby, Carl? Personally, I think it’s just gonna take the name of the associated nearby island. Geirfuglasker or Eldey. Múspell would be cool, but it is on a different geological line than Surtsey (Surtsey is part of Vestmannaeyjar). Eldey is a bit farther away on the central volcano’s massif than Geirfuglasker, but it is very likely part of the system. sky wasn’t glowing before, and that was not a flash of lightning, it stayed that way for some time. When steady moist winds pass over a mountain, it causes the air to speed up, heat up and loose moisture (in French or Swiss Alps, that’s known as Foehn effect, and this accounts for the days with temperatures >20°C and cloudless skies you can get in Grenoble or Turin in January). If this stream of hot, dry air contacts downwind of the mountain the incoming moist wind, very strange, “cap” like cloud structures will appear. Very pretty. The clouds in the center in the valley are what interested me. There is no mountain there. Do lenticular clouds form over valleys? Also in the video (not still) there was a lot of “updraft” activity. Also, apparently (?) the small mound on the left is a cone, so the clouds in the middle are between the cone and Mt. Agung. There has also been a persistent glow in that area. What I’m wondering is if the center of the volcano is not directly underneath Mt. Agung. Here is the same view without clouds, it might help in interpretation. Fascinating video, especially for anyone with an interest in meteorology. I would happily watch it for the cloud action alone. There’s a lot going on there. One of my son’s will be beginning teaching soon. Would it be possible for him to use some of the information here on volcano cafe to make the lessons more interesting? Your articles are so much more interesting than most text books. Happy New year to you and all the contributors of volcano cafe. That is a very good question. Teaching requires authorative resources. At the very least, that requires an author, preferably one with credentials. We try to be comprehensive in our posts and present the established views, i.e. backed-up by scientific, refereed papers. Where we speculate, that is clear from the context. We do aim to present the subjects in new ways, and not just copy what is already available elsewhere. From the responses, the readers seem to appreciate that. So I think the material here is useful for teaching and learning, but as a secondary rather than primary source. On the other hand, I have seen some howlers in those primary text books..
All of the VC posts are public and can be used, with the proviso that the copyright resides with the author. Widespread unrest in the icelandic ground also in some less common places. Follows on swarms in the Tjörnes area and along Reykjanes ridge. Is this a repetitive pattern? (I have followed Iceland only since 2011 and during this extremely short period I think I have seen it several times). The latest series of quakes in Katla area not as shallow as for the last years….. Maybe a another plume pillow pushing up? Don’t know about such repetative. What I have noticed that the deeper quakes often come wide spread, not sure about a pattern in those. Kistufell and Kverkfjoll had some deeper aswell lately. The Elbow, or named Greip also lately, often has three or four deeper quakes within a few hours. Small swarm this morning there. Would be intersting trying to find a sequence in the deeper as some contributers mentioned before. Yes, it’s a nice deep vertical stack at Greip. How about the cluster at Torfajokull? It is a shallow swarm. The past two hours there have 6 ash or smoke plumes (hard to tell the difference at night). Small but frequent. And now impressive fireworks on the camera! Real ones: it is midnight in the area and the start of 2018. Thank you Albert, Happy New Year! And I wish all readers a very happy 2018! It has been a year where Iceland showed that it can still surprise us and Indonesia showed us volcanoes do what they want – not what we want. And the biggest bang came at the end of the year, from a volcano with no name in Russia. Seems fitting. I always like to look back at the posts published during the year. It has been quite a variety. My favourites to write were Echoes from a silent spring (http://www.volcanocafe.org/echoes-from-a-silent-spring/), Up (http://www.volcanocafe.org/up/) and Iceland’s secret heart (http://www.volcanocafe.org/icelands-secret-heart-hofsjokull-volcano/). The other contributors will have their own favourites. What was your favourite reading of the year? And any wishes for 2018? This is your chance! If you have a suggestion for a post, drop us an email or a comment. (Or even better: send us the draft post!) And which volcano would you like to see erupt during 2018? Happy new year Albert and to all who read, comment and contribute to the blog. Once I get into a routine with my newborn son (still cooking currently) and my three year old has found his new place in the new family dynamic, I should be able to contribute more to commenting and writing posts. I didn’t get chance to do much this year, but I hope you all liked the revisited Deadzone 2 and Greip articles. Look out for more fancy graphics and plots as well as a new look VC in the new year. The one about the effect of gravity, especially regarding the rifts from the Bardarbunga area, was my favorite. For 2018, I’m taking my family (9 of us) to Iceland! A Happy New Year to all volcano enthusiasts here and a special “Thank you!” to the writing-team of VC! As a layperson I have learned so much about geology! Happy New Year to my Volcano Cafe pals. Have a great 2018! I have learnt so much this year from your articles and discussions that I can’t keep quiet. My wife is used to be glued to articles about Dead Zones – bit like my brain. I wonder which volcano will bring us our first 2018 eruption? (Not counting the ones currently on rinse-and-repeat). While some have thrown in the towel on Agung, personally, I don’t think it’s over. Kelud went forever before getting around to doing anything. I just hope the “flip-flip videographer” is not up on the summit when it decides to finish up the show. VolcanoCafe attracts a widely varied amount of people. If any of you have any experience or knowlege of fluidized beds, ya might try turning your analysis skills at the crater of Agung. To me, it seems like a hugely oversized fluidized bed. There are some specific mathematical formulas that describe the behavior of fluidized beds. They might offer some insight into what the crater is doing. It’s beyond me, but it would probably be enlightening if someone with the skills took a look at it with the appropriate math. For one, the rate of gas flow in the bed (and particle size) determines the functional viscosity of the bed, and the apparent density of it. Yes, I know it is a bit of a reach, but using the math from one field can shed information about another. I used a milling formula on the average ash particle size from Kelud to get pretty close to the actual energy release of the explosion. Think outside the box, sometimes you get pretty handy results. They may not be dead on accurate, but you can get really close in your estimates. Agung, in the current state it’s in, can’t do anything else than a big blow up. Except going extinct, but that’s almost out of possibilities. The real question is not if, but when. Kelud took 7 years to reach critical pressure. Soufriere St Vincent also took 8 years, from 1971 to 1979, to muster enough energy to blow itself up. There’s no way of knowing. Yet another case of lit dynamite stick with unknown length of fuse. And as everyone celebrates the start of a new year, a note. With respect and no aspersions intended, I think a Moon Pie in Alabama is more appropriate than a…a…nevermind. When i first did a quick scan I read “Penguin.” Then I saw “Pelican.” And I’m only on my first glass of wine. My wife was ticked off that the local TV station didn’t feature the @#$ Pelican drop. Turned out that they dropped the thing at 8 pm (2000). Sort of defeats the whole purpose of the thing. This is par for the course in Pensacola, they are continually shooting themselves in the foot or messing up a good turn of luck. Personally, I attribute it to the much celebrated founder, Tristan de Luna, genuine idiot. He left his ships at anchor in the bay and went traipsing off into the woods searching for the local tribes and their gold. He made it as far as an abandoned village near the northern reaches of Mobile Bay before giving up and heading back to Pensacola. By that time, a Hurricane had devastated his flotilla (September 19, 1559)… complete with the supplies that were never unloaded. To this day they are still finding bits and pieces of his flotilla. Of course, that also means he rode out the hurricane while standing somewhere around in the woods with his thumb up his arse. In retrospect, I can’t think of a more fitting founder for Pensacola. Because of his incompetence, Pensacola had to be abandoned and recolonized later. This is why St Augustine FL holds the title of oldest European settlement and not Pensacola. As for the Moon Pie, I agree. It does fit Mobile quite well. Some may associate Moon Pies with Mardis Gras parades, but Mardis is celebrated among a lot of Gulf coast towns, especially those with a French heritage. Mobile calls theirs “Joe Cain days.” Cain was purportedly responsible for bringing Mardis Gras back to Mobile. He dressed up as a fictional Chickasaw native chief and partied his way down the street. Mainly to taunt the Union soldiers who were occupying the city at the time. Reportedly, the Chickasaw were never defeated in battle by the union army. I was trying to be a bit humorous on New Year’s day, but thanks for your considered and historical reply. I’ve never seen the pelican (or penguin) or Moon Pie drop, but my wife and I did watch the ball drop in NYC. must say, we were a lot warmer (and had a bathroom to go to). The only other thing I know about Pensacola other than the Air Station is that there is a lab there that we send samples to (and get great service). The “Navy Police” aspect of it was quite entertaining (a TAD billet – Temporary Assigned Duty. All subordinate commands have to provide temporary manpower to fulfill the tasking.) A step above the typical Shore Patrol, we were the principle liaison for retrieving service members from county jail. While I was there, we only had to go off bond for one guy, he was quite surprised when we showed up at his barracks to take him back to the county jail because he failed to appear at his court date. He became quite somber when I had the control room guy drop the sallyport doors before I got him out of the van. I didn’t have any sympathy for him, he could have avoided all of that by showing up at his scheduled time and date. The county personnel would ensure that he didn’t miss the rescheduled date. Translation by Google. Despite the language barrier I come to read almost daily. A few years ago, one of the first things I wrote here was this impression that I had, and still have, that Iceland was going to be redrawn. This article seems to go in this direction. I am still fascinated by the geology of this island … even if I do not understand everything. You do a great job on this site and do not stop educating us. This site is a treasure-trove of information run by very friendly people, and it’s to me the same kind of daily pleasure reading it as it’s for you. Yep, the language barrier may be a bit high to jump over (and you can probably see the results with my half-broken English), and, as I’m no expert (and don’t have the chance of having a volcano sitting in my backyard), some technicalities can be quite puzzling. To all the wonderful people here, I wish you a happy new year, first of all in good health and spirit, but also replete with volcanic action. Hopefully, a few big booms away from any populated areas (in the depth of the Andes, Kamchatka or Iceland) could provide some spectacular scientific thrills without putting anyone in harm’s way. We don’t want more of Agung, but a few Bezymianny’s and Bogoslofs here and there should keep things interesting. Big thanks to those who make VC possible! What 2017 article I like most? Very difficult. First, the articles & posts (!) 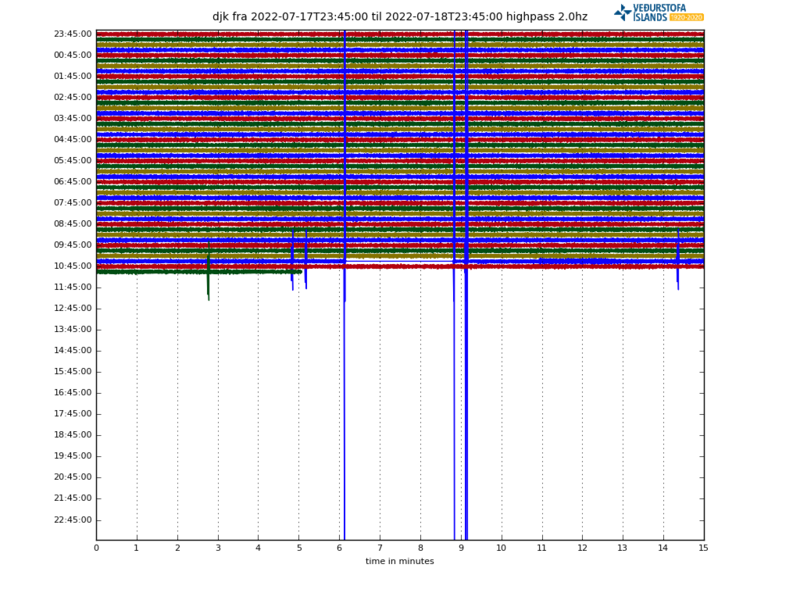 in which earthquake- and gps data are plotted by Andrej and IanF and are (or attempts to get those) analysed. Second, the CO2 related series. First, stay healthy all of you! Second, throw that wordpress blog in a litter can, and start a new forum (like) community, so much easier to categorize the subjects and (most of all) READ BACK articles plus comments. I really desire a better read back function. My feeling is that it is really a waste that so much interesting knowledge gets out of reach after a short while. Happy New Year to all fellow volcaholics! It’s still Dec. 31, 2017 here. I have 50 minutes to go. It’s hard to pick which is a favorite out of a lot of good picks. I always like articles on Iceland’s volcanoes. The one on Vesuvius was another one. My favorite article though was written a couple of years ago on Taal. Bardarbunga is looking on the way to another sizeable eruption, oraefajokull is now active and probably only a matter of time, and grim scorn, hekla and katla are all possible as well. The intrusion under one of the reykjanes volcanoes earlier this year might mean that area is waking up too and as the century progresses the area might reawaken. I’m guessing the reykjanes peninsula up to Reykjavik is going to be addressed in the next mammoth guide to Iceland. Now, I don’t know if the implication is that it is a forming feature, or if it refers to an increase in activity. Stuff like volcanoes and hotspots operate in geologic time, which is hard for normal people to wrap their head around. Geologists know this term and concept well, and occasionally talk in regards to it. The difficulty is that sometimes we normal people don’t get the context and come to a different meaning that what was intended. What they refer to as a forming system or feature, may have been doing so for thousands of years and is young in it’s normal life history. Other commenters here on VC have noted that activity in Iceland tends to be periodic and that we are entering what should be a period of higher activity. As with all things volcanic… time will tell. The question is which one is next. Grimsvotn will probably erupt between 2018 and 2021, as this volcano is quite predictable according to cumulative seismic release. Katla and Hekla are possibly ready for an eruption (magma chambers probably filled), but such eruptions would be only triggered by one significant sizeable deep intrusion, and that can happen anytime and it can´t be predicted. Reykjanes already suffered large intrusions, so I think this one is ready for an eruption, and like Hekla or Katla, is just awaiting the final trigger intrusion. Oraefajokull. I would say it would require a couple of years more. Askja is another likely candidate too, but less likely to erupt than the ones above. Bardarbunga deflated considerably after its eruption, so I would be inclined to say that it will not likely erupt in the next few years, despite the fact that one could expect a few eruptions within the next couple of decades. It took Eyjafjallajokull about 10 years from the first intrusions until its eruption, so I would guess-estimate a similar timeframe for Oraefajokull. I would guess Grimsvotn, Katla and Reykjanes as most likely candidates. I’m guessing an eruption at reykjanes would be quite a spectacle… Possible big lava eruption on land, or a new island formation just off the coast. Both could happen very close to the airport which could be for better (very accessible eruption) or for worse (ash preventing planes from landing). Is reykjanes/geirfuglasker the only volcano on the reykjanes peninsula to have erupted after the 14th century? Happy New Volcano-watching Year to sheep and daleks everywhere. Looks like we’re going to learn a lot of interesting stuff this coming year. May your lives be exciting and peaceful this year. And many thanks to all those contributions done in 2017 to VC. Many excellent articles! It may be worth keeping an eye on Mauna Loa. In the past few days there have been some very shallow earthquakes in the southwest rift zone, close to the caldera. That seems new. mmmmm maybe or maybe not. I’m wondering if Mauna Loa is on a rather long cycle. If you look back at the history, it erupted regularly ~2-3 times every decade or so, throughout the 18th century. Eruption frequency declined pretty much through the first half of the 20th century, and there have been only two eruptions in the last six decades. The current interval of 34 years and counting is by far the longest in the last nearly 200 years of recorded observations. The last couple of eruptions at least have had some strong precursory earthquakes – up to and over M6.0 – and we’ve seen nothing like that yet here. I seem to recall reading a paper which implied a spatial cycle to Mauna Loa eruptions also; a purported long-period cycle between summit eruptions, and flank or rift zone eruptions. And if my recollection is correct the inferred periodicity in that paper suggested we might be on the cusp of the transition between a phase of predominantly rift zone eruptions, and a phase of predominantly summit / lava lake eruptions. Mauna loa also seems to alternate with kilauea for number of eruptions and eruption size. Kilauea had infrequent actual eruptions (1823, 1840, 1919 and some small ones which are little known over a 100 year period) until 1952 when it has so far been erupting more often than it hasn’t, and claimed ‘most active volcano on earth’ status. It was also very active in the 18th century (especially 1790…) and apparently also in the first half of the last millennium there was continuous activity including very extensive lava flows on all sides. Mauna loa had its first historical eruption in 1843 which was quite a long time after Hawaii was known to Europeans (since at least 1790) so maybe it isn’t entirely unprecedented that the last eruption was 34 years ago. 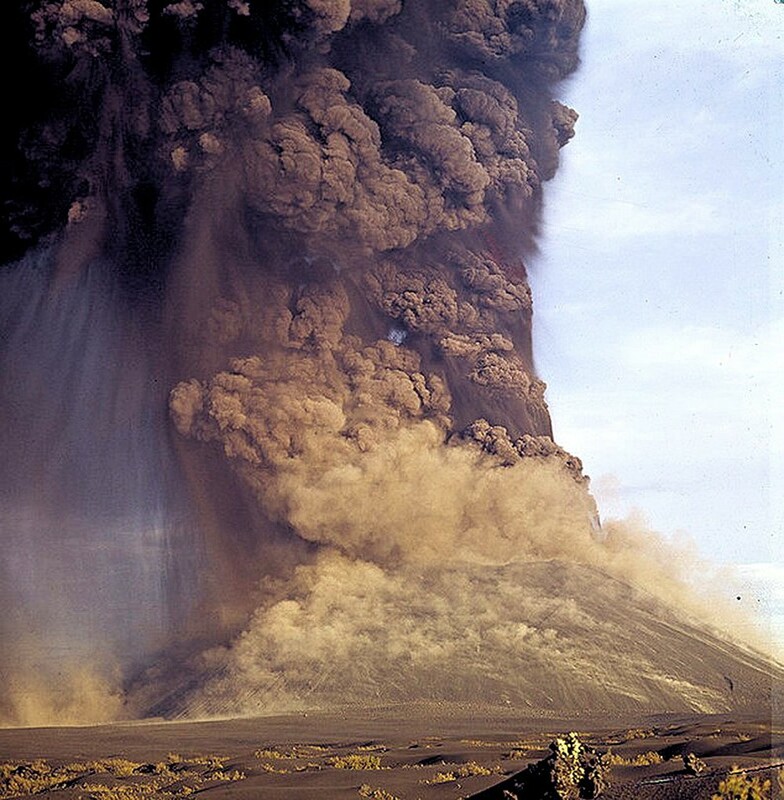 Puu o’o also started becoming more than a standard eruption around 1984. Over the past few thousand years, average time between Mauna Loa eruptions have been around a decade. That is just from counting different flows. Before 1200, the flows mainly came from the summit and apparently the crater only formed after that. Since 1200, eruptions begin at the summit but very quickly migrate to the rift zones, and it has been suggested this is because of the very larger eruption around 1200 drained the summit magma reservoir (and thus formed the crater). There was a very large earthquake in 1868 and that also seems to have changed the magma chambers and has reduced lava output since. Whether it is cyclical – it certainly changes behaviour back and forth but perhaps not on a strict schedule. The shallow reservoirs are now more filled than they were before the 1984 eruption but that may just mean it is still in a recovery phase from the earlier events. Wait and see! You say there was decreased lava output after 1868 but its biggest (most intense) eruption in several hundred years happened in 1950. And also it’s 1881 eruption was the only eruption to reach within Hilo, and apparently that only happens every few hundred to over 1000 years. So I’m not sure if it decreased at all really until after 1950, which could be because of that eruption draining a lot of magma from the magma chamber and later diversion of most of the plume to kilauea where it has mostly stayed since then. 1975 was when it had eventually refilled its magma chamber, and 1994 was when it drained out again though not as much. 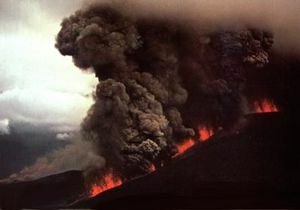 By then the still ongoing puu o’o eruption had started and so provided a better pathway for the plume to release from. Kilauea and mauna loa aren’t directly connected but they do probably overlap in where they get their magma so maybe more is going to kilauea now and mauna loa is slowly recharging but probably close. It’s next eruption might be small like 1975 but followed later by a bigger lava flow like in 1984, only probably on the southwest rift where most of the inflation is happening. Interesting little offshoot out of Griep during that swarm, unusual if the locations and depths are correct. Thanks! Allways exciting to look att yuour updates!